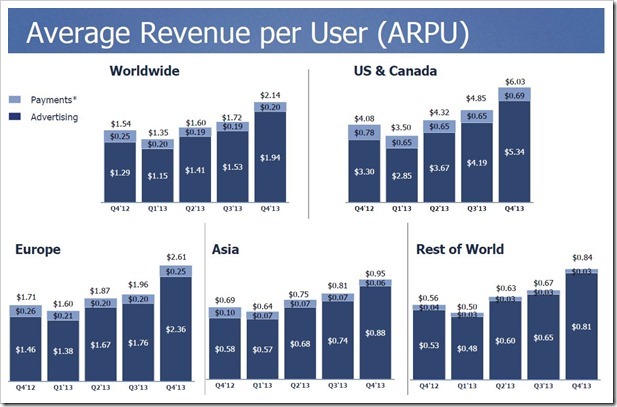 Facebook has just released its Q4 2013 results, and going by the numbers, it’s excellent. In fact, this was the first billion dollar mobile ad revenue quarter as Facebook generated staggering $1.25 billion from mobile ads. Overall, revenues have beaten market expectations and the stock market has reacted positively to the results. The single biggest positive factor which was witnessed in the earnings report was the fact that now, 53% of Facebook’s revenues is coming from mobile advertisements. At the start of the year, Mark Zuckerberg had said they are looking forward at growing revenues from mobile platform, and the gamble has paid off. 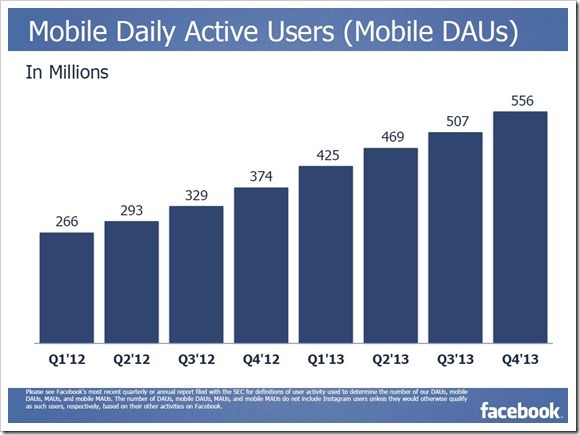 When Facebook’s IPO was launched in May, 2012, mobile revenues stood at zero. But within 19 months, Facebook has tremendously improved their mobile offerings as advertisers are now ready to spend on the platform. 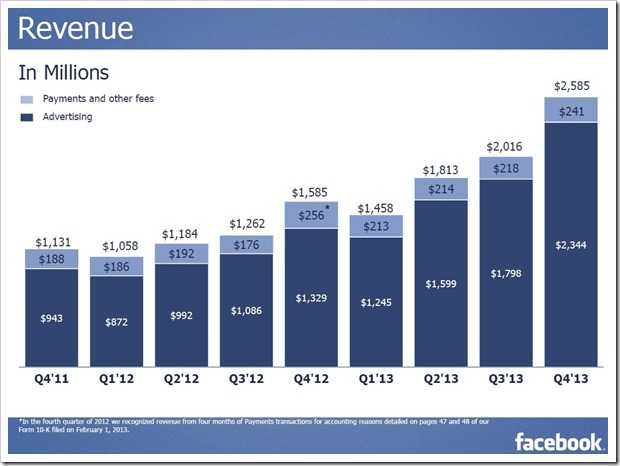 As of December 2013, more 1.23 billion users are on Facebook, generating annual revenues of $7.9 billion, which is 55% more compared to last year. For the last quarter ending December 31, 2013, Facebook generated revenues of $2.59 billion, out of which 53% came from mobile advertisements. Share holders earned 31 cents per share. Market analysts had predicted $2.33 billion in revenue with earnings of 27 cents a share. Hence, Facebook beat market expectations by 11.50% in revenues and 14% in earning per share. With healthy increase in Mobile Ad spend, Facebook is now looking at a positive start to 2014. But there are several challenges as well like decline in teenage users in US and Europe and issues pertaining to Privacy. But overall, it was a great 2013 for Facebook! Chrome Apps Coming To Google Play & Apple Stores!